Honours were widely spread at the Sellars Agriculture Black Beauty Bonanza show of Aberdeen-Angus calves and yearlings at the Thainstone Exchange, Inverurie, Aberdeenshire on Saturday (November 14). The show, organised by the North East Aberdeen-Angus Club attracted an entry of 120 head from 29 herds with top honours being shared by the Scholland, Mosston Muir, Deveron and Blelack herds. The show drew warm praise from the judge, Doug Robertson, owner of the famous Coldstream herd in Alberta, Canada, who said the top cattle could compete with the best Aberdeen-Angus anywhere in the world. Mr Robertson judged Canadian style by placing the cattle from bottom to top which held the attention of the large audience throughout the judging of each class. He also gave a commentary on his placings at the end of each class. “There was strength in depth in every class and the whole show was a credit to the exhibitors, stock handlers and the North-east club,” he said. Leading the strong show of yearling heifers was a 16 month old heifer which minutes before she was made yearling heifer champion was sold privately for £15,000 – the highest price paid for an Aberdeen-Angus heifer in the UK this year. 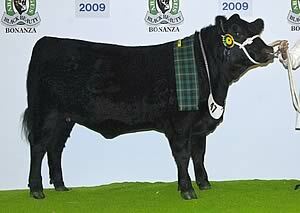 The heifer, Mosston Muir Eline H205, is a daughter of the top performance sire credited with transforming the Aberdeen-Angus breed over the past decade, Rawburn Transformer. 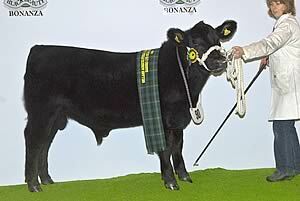 She is in the top 1% of the breed for bother Terminal Index (35) and Self Replacing Index (52). 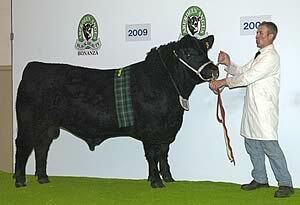 The heifer has been a consistent winner in the show ring this year – standing reserve to her championship-winning dam, Mosston Muir Elsie D082, at several shows – and helping owner, Tom Rennie, Mosston Muir, Guthrie, Forfar, Angus, win the Walkers Shortbread Aberdeen-Angus Show Herd of the Year trophy for 2009. Both the yearling bull classes were led by entries from the Blelack herd of Neil Massie and Sons at Dinnet, Aboyne, with the championship going to the 19 month old Blelack Lord Hildalgo H972, a powerful son from the first crop by Netherallan Peter Pershore E052. The long sea journey from the Shetland Isles proved worthwhile for new breeder, Jamie Leslie, Scholland, Virkie, Shetland, who won the heifer calf championship with the nine month old ET calf, Scholland Diana J406, by the Hoff Limited Edition SC594 son, Rawburn Echester D297, and out of Skaill Diana E355. Mr Leslie also won the award for the best small herd. Enjoying a highly successful day were Hamish and Margaret Sclater whose Deveron herd at Denhead Farm, Dunlugas, Turriff, picked up the bull calf championship in the 60-strong bull calf section. Their winner was the April-born Deveron Jackson Eric J283, by Blackhaugh Easy Papa G733, a sire recently sold to the Blackthorn herd in Cheshire. Two daughters of the Blackhaugh bull also headed two of the four heifer calf classes with the seven month old, Deveron Jasmine Erica J272, going on to stand reserve for the heifer calf championship. For the third year running, Mr and Mrs Sclater also won the coveted McCombie Trophy, presented by Mrs Elizabeth McCombie, for the best pair of calves. Reserve was Mrs McCombie’s son, Charles, of Auchincrieve, Rothiemay. Last year’s heifer calf champion, Deveron Elize H232, bred by the Sclater’s, stood reserve to the Mosston Muir heifer for the yearling heifer championship for her new owners, Oliver and Clare Russell, owner of the oldest herd in the breed at Ballindalloch, Banffshire, which was founded by Mrs Russell’s ancestor, Sir George Macpherson-Grant, in 1860. The heifer, also by the Blackhaugh sire, was a first prize winner at Perth in February when purchased by the Ballindalloch herd for the top price of 6000gns. Also enjoying a successful outing was Neil Gillanders, Eastville, Hatton, Peterhead, whose Newfield herd won two of the six bull calf classes with the seven month old, Newfield Pegasus J354, by the home-bred, Newfield Prince E149, going on to take the reserve bull calf championship. The second prize winner in the senior yearling bull class followed the Blelack bull all the way through to take the reserve yearling bull championship. This was Schivas Quigley H595, a February-born son of Ballathie Lord Jack C230, from Lord Catto’s Schivas Estates Ltd, Ythanbank, Ellon. No fewer than 30 youngsters took part in the junior showmanship competition on Friday evening with the leading awards going to Hayley Massie (13 years and under), Gary Morrison (14 – 16 years) and Claire Johnstone (17 - 24 years).